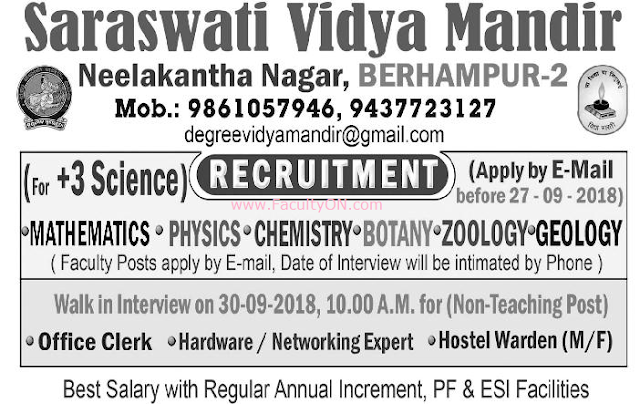 Saraswati Vidya Mandir, Berhampur has advertised in the SAMAJA newspaper for the recruitment of Lecturers Plus Non-Faculty jobs vacancies. Interested and eligible job aspirants are requested to apply (Lecturers) on or before 20th September 2018 and Walk-in (Non-Faculty only) on 30th September 2018. Check out further more details below. About College: It is a co-educational institution under self financing scheme registered under society registration act 1860 to impart national class quality education under C.H.S.E syllabus, Govt. of Orissa. The institution has got permission, recognition and affiliation vide letter no. 613/24-03-2007, 3205/28-11-2008 and 35 25/28-03-2009 against sanctioned strength of 512 for Sc. & 128 for Comm. The institution has its own land & building satisfying Govt. of Odisha norms. Which adds momentum in its office neatness. How to Apply: Interested and eligible candidates are requested to send CV, copies of certificates and recent PP size photos to the email address provided below. Candidates for non-faculty posts may attend the walk-in interview at the college campus on 30th August 2017. For Teaching Faculty posts, the walk-in date and time will be intimated through phone.